Peter Lawrie might be golf's "Mild Thing" but the Dubliner is set to land a major sponsorship deal after letting his clubs do the talking. Lawrie has been wearing a four euro hat he picked up in Malaysia and carrying a logo free bag since he decided not to renew with Srixon last year. 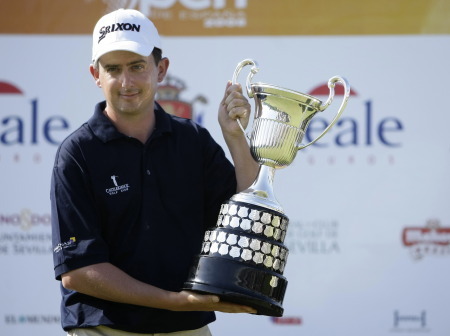 Peter Lawrie is a proven winnerBut his superb performances on the course have helped the Castleknock touring pro clinch a megabucks two-year deal with a European investment company. Euan Inglis of Golf Management International said: "We are hoping to announce a lucrative deal for Peter this week. "He's a guy who works very hard and he's such a nice guy, he is just a perfect ambassador for any brand." Lawrie broke his tour duck last year when he clinched the Spanish Open in a heart-stopping play-off in Seville. But he is such a low-key personality that he was ignored by the sponsors when he returned to defend the title last month. Surprised that the tournament promoters did not have his photograph on display at PGA Golf de Catalunya, he made his point with his clubs by finishing tied third. Wild Thing John Daly has been a major draw so far this year because of his wild lifestyle and outlandish trousers, Lawrie prefers to make a splash with his scores. He said: "I try let my golf do the talking. I have to entertain people with my golf and the rest doesn't interest me. For people to be talking about me wearing whatever doesn't interest me. "As long as I keep on playing the way I am playing everything will fall into place eventually." Yet to rack up a top-10 in the Irish Open, straight hitting Lawrie is hoping to change that trend at Baltray this week. He said: "The key around here is to keep it straight and have a good short game. You also have to be good in the wind, but straight hitting and a good short game are two of the strengths of my game." 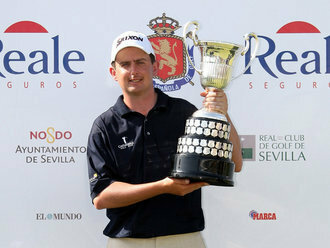 Peter Lawrie has set his sights on challenging for the Irish Open after making a sterling defence of his Spanish Open title in Girona. Peter Lawrie tees off on the first in the third round of the UBS Hong Kong Open. Photo Jenny Matthews/www.golffile.iePeter Lawrie entered the week comparing himself to the Gingerbread Man as he prepared to fend off the challengers to his position as the man in the Race to Dubai hotseat. Race to Dubai under threat?